Should MyPlate be Your Plate? Snack Girl is probably the last website to feature the USDA's MyPlate. And, yes, dear readers, I have a big problem with it. What is up with that FORK?!! How could you not include the Asians who eat with chopsticks or the Africans who eat with their hands! SHEESH, talk about an excluding people. Actually, I think much of their advice is sound (I could nitpick). If we all took their advice and filled half of our plates with fruits and vegetables we would get a lot healthier as a nation. See their website for a comprehensive discussion of the MyPlate Plan: ChooseMyPlate.gov. Harvard's School of Public Health's Healthy Eating Pyramid is their response to the USDA's pyramid - now a plate. Read a discussion of all their recommendations here: Healthy Eating Pyramid. What I like is the bottom of the pyramid - the base of healthy eating is exercise, watching your weight, and portion control. Yes! These actions are the most important in terms of a healthy diet. They also give suggestions on the protein level of the diagram. There are nuts, tofu, beans, and seeds! The red meat is ALL the way at the top in the "use sparingly" column. And, they put optional: "alcohol in moderation" on the side instead of "dairy". Now, that is my kinda pyramid. Harvard criticizes the new MyPlate by not going far enough in their recommendations and the criticism is outlined here: New U.S. Dietary Guidlines: Progess, Not Perfection. Wow! They are actually seeking perfection from the government. A bit idealistic, no? The big message for me from the Healthy Eating Pyramid is that I must treat exercise like healthy food. I must get some at least every day and it will nourish me. For my children, I have been introducing them to different sports. My seven year old daughter tried softball in the spring, and my five year old son is trying soccer in the fall. Both of these activities were very low cost (run by my small town). Yes, it takes some coordination to get them there - but I feel so good about supporting them in physical activity. What do you think of MyPlate and the Healthy Food Pyramid? I'm impressed by this pyramid. It makes a lot more sense than anything I've seen before. I'm also amazed that it recommends a multivitamin. It's always been a standard of nutrition teaching that if you eat right, you don't need vitamins. I'm pleased to see movement from Harvard, if not from any other teaching organization. The difference is the targeted audience. Anyone can understand the plate in 3 seconds or less, whereas the pyramid would require thinking, which isn't everyone'c cup of tea. E got it right - they are trying to make it simpler to understand, so the plate works. I like the wine on the Harvard pyramid though! I get what the USDA was trying to do. But something bothers me... Someone could eat canned fruit in syrup, white rice, chocolate milk, steak, and fried zucchini and believe they are eating healthy because they have "followed" the recommendations according to the picture. The Harvard healthy eating pyramid is MUCH better (and probably one of the best I've seen) but I agree with E, those who don't care to read it, won't spend the time to look at it and properly use it. The plate is way easier to understand. I think that people who are not well versed in nutrition (and heck, people who ARE well versed in nutrition) will have a hard time trying to figure out the pyramid. What does it even mean? there are no recommended servings per day, there are no values, there is no guidance on how to build a healthy meal or snack. Since the (food) base of the pyramid is veggies and fruit, fats, and grains does that mean i can neglect the other food groups? Teaching people how to build a plate and then educating on how to improve their choices for each food group seems to be the more logical way to me. I think the plate is a great start for teaching young children about healthy eating. It's not perfect, but it's a start! And yeah, ditch the fork. I like that the Harvard pyramid included exercise. The government tried exercise in their last pyramid, then ditched it! And if you filled up a regular dinner plate with that much food, it would be way too big of a meal, so I like the Harvard pyramid portion control base. Thank you for sharing this! When MyPlate came out, I thought it was too simplistic and missing some major points! Something that sticks with me is the "Dairy" label on MyPlate. It's not DAIRY that we need -- it's calcium. I linked to the blog article that I co-wrote with one of the nurses here at FCHP. Thanks for the tips to the different (and better!) food guides! I also don't see people going to the trouble of reading and following that pyramid but I do like it better. This is a little misleading. The Healthy Pyramid from Harvard isn't a response to the plate. They developed that pyramid several years ago. IMO, the plate is better in that it demonstrates that veggies and fruits should be the bulk (no pun intended) of the plate in front of you. I disagree with the dairy thing. For the general public, we need something super simple. For people who then want more info, we need something more detailed. People who think MyPlate is too simplistic probably don't do any nutrition education. As a registered dietitian I know that the average person knows very little about healthy eating. For the health conscious consumer who wants to dive deeper there is more info on the USDA's website. However, most people would do themselves a tremendous benefit to eat 1/2 fruits and veggies, even if they didn't change anything else! I also think the "dairy" is there as a support for US dairy farmers and not necessarily a diss to calcium. After all, eggs are considered dairy and are a source of protein. I'm not sure...I'm very impressed with the pyramid for being very detailed, yet to the average Joe (or Betty, or Jane/John Doe), the MyPlate is the overall sort of thing. All you need to know is veggies, fruits, whole grains, dairy, & protein (although, Americans do get MORE protein than they need because of the consumption of meat). 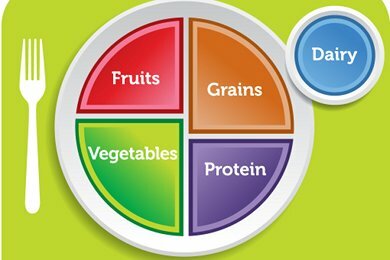 So the MyPlate is very simple. I like both charts..
Liking the Harvard pyramid. They're quite clever those chaps and chapesses aren't they. when I first saw the myplate I had to think where's the healthy fats? Or is that too specific or do they think the "common mind" immediately thinks fats = bad? I love your recommedation about dropping the fork:-) Myplate recommendation is just recommendation of Western diet with more fruits and veggies. 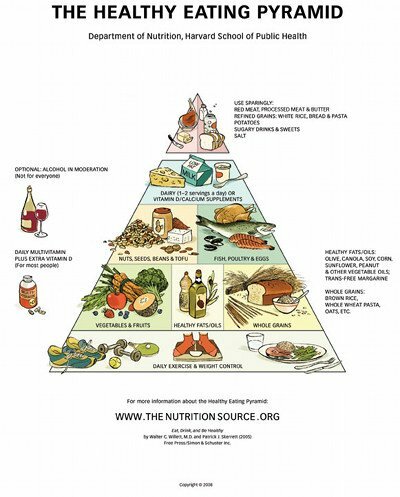 Harvard pyramid is better, but I have also seen pyramids from Mayo clinic for Asian and Mediterranean diets as well. I like the plate. I learned about the food pyramid in elementary school so I assume they are going to teach this plate to elementary school students. The plate is a great visual for kids (and adults) to see and understand. Now if only my husband would bother to learn what foods make up each food group! And maybe I'm too ego-centric but I like the fork, too. It completes the look. This is a USA guideline for Americans and while I understand some first-generation immigrants might not use forks, their kids probably do. The Harford pyramid is nice if you're into nutrition but as others have commented, most people aren't. I haven't reseached it but I bet canned peaches in syrup is healthier than french fries and it would be a positive step if Americans would change their lunch side to canned fruit or even sweetened applesauce instead of fries. I'm glad to see someone else does not like the new "plate" representation. I personally preferred the old pyramid, and I like Harvard's even better. But to get the point across to my children, I follow these simple guidelines: get adequate sleep, plenty of fresh air and sunshine, play every chance you get, and eat when you're hungry. When eating, try to eat foods that are "whole," "fresh," "unprocessed," and as close to "fresh from the garden" as possible. My husband and I were at odds about making our children eat "at mealtime" and always cleaning their plate, until our daughter (8yo) started bringing home stories about girls in her class who are **dieting**. We want no part of DIETS, as the term so commonly refers, in our house. OUR DIET is simply what we eat--nothing more, nothing less.